Ed: Although well publicised, there are no grounds to presume any editorial staff of the trade press have read this report, judging by what specious remarks have been made. For its better elucidation: I have attempted to cull from the full text (which may be copied, as a convenient down load, at our web site) some of its relevant findings. I have found nowhere that concludes children to be at greater risk from either Mesothelioma or Lung Cancer and many places where data and arguments conflict – indeed to the degree that some scientific assertions are simply incorrect. The editing committee is the first to admit the frailty of presuming many conclusions from the studies referred and, overall, there is perhaps, some logic and advancement in the proposals (for occupational, asbestos exposure limits)….. Relative Vulnerability of Children to Asbestos compared to Adults – WATCH position Statement and HSE view on the Risk Assessment by the Netherlands. 1. The Department for Education (DfE) has asked for advice from the COC on the vulnerability of children to asbestos to inform the discussions of its independent “Asbestos in Schools Steering Group”. 2. The Health and Safety Executive’s scientific advisory committee, the Working Group on Action to Control Chemicals (WATCH), which advises the Advisory Committee on Toxic Substances (ACTS) and HSE on scientific and technical issues relating to the assessment and control of health risks from chemicals, has recently examined the risks from low level exposure to asbestos in adults. It concluded that a definitive numerical value could not be placed on the risks from low level asbestos exposure and stated that “the risk will be lower, the lower the exposure, but “safe” thresholds are not identifiable”. Therefore, the COC secretariat considered that it would be impossible to advise on the absolute risk of asbestos in children, for whom there are far fewer data. It was agreed with DfE and DH that the COC would be asked to advise on the relative vulnerability of children to asbestos compared to adults. 3. At the July meeting, the secretariat outlined its strategy for this review. It was agreed that the secretariat would provide the WATCH statement, attached as Annex A. At the February 2008 WATCH meeting, a number of approaches were suggested for how the issue of characterising the levels of risk involved in low level exposure to asbestos could be taken further forward by WATCH. One of the approaches considered by WATCH to take their proposals forward was to perform “Reality checks” of Hodgson and Darnton models for various population subgroups. It was suggested that further work could be carried out to investigate the apparent relationship between the data for environmental air asbestos levels (historically and currently) and the risk of mesothelioma in the general population. However, the COC secretariat could not find reference to this approach in their further meetings and therefore asked the HSE for comment on whether this approach was taken forward. Please refer to Annex B. 4. In 2010, Committee of the Health Council of the Netherlands put forward new values for chrysotile and amphibole asbestos, corresponding to the risk levels defined in the context of environmental and occupational health policy. The new values were calculated on the basis of a new meta-analysis commissioned by the Committee in the Netherlands. The Executive summary is attached in Annex C. The secretariat sought HSE’s view of the 2010 assessment of the Risks of environmental and occupational exposure to asbestos by the Health Council of the Netherlands and this is attached as Annex D.
(which includes crocidolite, or blue asbestos, and amosite, or brown asbestos). Chrysotile asbestos accounts for more than 90 per cent of asbestos applications. Proposed new MTR and VR values and the existing values for asbestos by type. The values are for lifetime exposure from the general environment, expressed in fibres/m3 as measured using TEM (Transmission Electron Microscopy). The proposed values are for the two health effects (Mesothelioma and lung cancer) combined. The Maximum Permissible Risk (MTR) values calculated by the Committee for chrysotile asbestos are about forty times lower than the existing MTR values; the Committee’s MTR values for amphibole asbestos are roughly thirty times lower. The discrepancies are attributable not so much to higher KL and KM values – where the divergence is relatively small – but mainly to methodological differences. Two such differences are of particular significance. First, as indicated above, the current policy is based upon concentration intervals, as opposed to estimates for specific concentrations, which the Committee prefers to work with. Second, the existing MTR and VR values have been assigned to the upper confidence interval of the calculated concentration; this has a particularly pronounced effect. On the other hand, the existing environmental quality objective is derived from the VR value, whereas, where other substances are concerned, the limit is derived from the MTR value. Consequently, although the existing MTR value for environmental exposure is considerably higher than the Committee’s value, the fact that the existing environmental quality objective for asbestos is based upon the VR value instead of the MTR value means that it is a hundred times lower than the limit proposed by the Committee. The proposed occupational exposure limits for chrysotile, for a mixture of chrysotile and up to 20% amphibole asbestos, and for amphibole asbestos on its own are presented in the table below. Exposure levels by asbestos type for Mesothelioma and lung cancer combined, corresponding to risk levels of 4.10-3 and 4.10-5. The values are for occupational exposure (eight hours per day, five days per week, for a period of forty years) and are expressed in fibres per m3, as measured by TEM. ………..“The RIVM* Guidance Document on Asbestos published in 1987 reported background asbestos concentrations measured by TNO** in the preceding years by means of transmission electron microscopy (TEM).6 In rural areas, the background concentrations were close to the detection limit of the TEM method then in use, i.e. 500 fibres/m3. In the Goor and Harderwijk areas, where asbestos was previously used for road paving, higher asbestos fibre concentrations were reported, but the exposure level was generally much lower than that associated with occupational exposure in that era. In urban areas the outdoor atmospheric background concentrations were between 1,000 and 16,000 fibres/m3 (0.001- 0.016 fibres/ml), but up to 80,000 fibres/m3 (0.08 fibres/ml) near to busy roads and tunnels; this compared with 100 to 1,000 fibres/m3 (0.0001-0.001 fibres/ml) in rural areas. *** Strictly speaking, the higher concentrations should not have been described as background concentrations, since they were in fact the concentrations in the vicinity of sources, such as road junctions (at a time when almost all vehicles had asbestos-containing brake linings. With a few exceptions, such as people living in certain locations near to Goor, most people nowadays experience very little exposure to asbestos fibres. Since the 1950s, it has been known that lung cancer is also more prevalent in people who have worked with asbestos. However, in contrast to the situation with Mesothelioma, there is a high background incidence of lung cancer in the non-exposed population (the general population). In the general population, lung cancer causes more deaths in men than any other type of cancer. The annual incidence in the Netherlands is seventy cases per 100,000 men and thirty per 100,000 women. Heavy smokers are at least fifteen times more likely to develop lung cancer than non-smokers. Epidemiological research has shown that the risk of lung cancer increases as the total amount of inhaled asbestos (usually expressed as the cumulative exposure) increases. The cumulative exposure – usually quantified in ‘fibre-years’, i.e. (fibres/ml) × years – is the product of the exposure concentration in fibres/ml air and the exposure duration in (working) years*. …. So, for example, given a cumulative exposure of 100 fibre-years, a KL value of 0.01 will result in a doubling of the relative risk of lung cancer**………………..
……… Cancer risk is determined by the cumulative exposure; a function of concentration and duration. However, with Mesothelioma there is a very long latency period of about thirty to forty years. This is probably due to the length of time needed for the fibres to migrate through the lung tissue to the pulmonary membrane (pleura)…..
… Fibres shorter than 5 μm are considered to make little contribution to the carcinogenic potency of asbestos (see subsection 2.2.1). These small fibres cannot be measured using PCM in a way that complies with the applicable counting convention….(Ed. 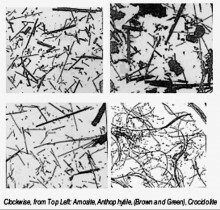 this defies the WHO’s considering all asbestos fibres commonly, regarding epidemiological study, because Chrysotile rapidly degrades from fibrous to particular form, as soon as wetted. It does not settle in the lungs or interstitial tissues as fibres, therefore and arguably should not be regarded more toxic than non-reactive mineral dust)…. The usefulness of earlier studies is limited not only by differences in measurement methods but also by the differences in the nature of the available data; for instance, data are incomplete, or have not been collected in accordance with current standards. In some studies, for example, the measurement strategy used to characterise the exposure – i.e. to assign exposure levels to samples of workers and in time based on measurements of airborne asbestos or external data – was not consistent with modern principles, resulting in the misclassification of exposure and potential attenuation or more generally bias of the exposure-response relationship. For some cohort studies, the researchers did not know exactly how long workplace exposure had lasted and they therefore simply made crude estimates regarding duration of exposure. In many of the studies, subjects were exposed to various types of asbestos. Moreover, the distribution of fibre lengths differed very likely from one study to the next or was not known; the asbestos that mine workers are exposed to will not exhibit the same fibre length distribution as the asbestos that people working in an asbestos textile factory are exposed to. Yet fibre length distribution data are available only for a few of the studied cohorts. There are also gaps in the information available regarding the asbestos-cancer exposure-response relationship. The relationship between fibre length (and diameter) and the carcinogenic potency of asbestos is not clear from the published research. Some data are available from animal research, but not readily transferrable to humans. Moreover, while recent epidemiological analyses suggest that longer and thinner fibres may play a more important role, the precise relationship between fibre dimensions and health effects cannot reliably be determined, because most of the studies provide too little information about fibre length and diameter distributions. Another shortcoming is that information about smoking patterns is available only for a few of the cohorts, meaning that the association between asbestos exposure and lung cancer often could not be adjusted for smoking. The shortcomings in the nature and quality of the epidemiological research described above are expected to lead to misclassification and bias the apparent association between asbestos exposure and the occurrence of lung cancer or Mesothelioma. The proposed new MPR and NR values for chrysotile, for mixed exposure (to chrysotile and up to 20 % amphiboles), and for amphibole asbestos alone are set out in Table 19. As explained in section 3, for policy purposes, a risk of 10-4 associated with lifetime exposure equates to the MPR. Similarly, a risk of 10-6 associated with lifetime exposure equates to the NR. Where amphibole asbestos is concerned, the values calculated by the Committee are determined mainly by the occurrence of mesothelioma, while for chrysotile lung cancer is the predominant outcome (the value for lung cancer is valid for all types of asbestos). Combination of the two outcomes results in concentrations that are up to about 60% lower than the values for Mesothelioma and lung cancer separately. Click the button below to add the COMMITTEE REPORT (CARCINOGENICITY OF ..Asbestos) to your wish list.